Session 396. After yesterday's rest day Tasmania delivered again! 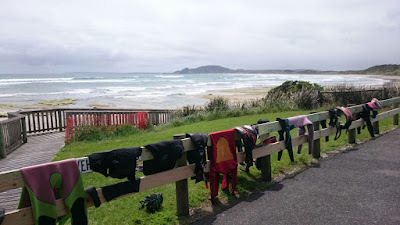 After great coffee at George and Dave's cafe we headed to the Port Sorell beach and the wind was blowing. It didn't seem strong so I headed out first to test it out, and yes it was GOOD! I immediately started tacking upwind and made it out past Pengiun Island carefully going over the shallow reef at the point. It was a glorious day with sunshine and clear water so I headed off for a short tour along Bakers Beach. It was a long way to the end of the beach then I returned holding ground. Stu S was coming out so I turned around and did it again - this time peeking around the rocky cape before returning. The wind was getting stronger so I cranked up the speed and did some nice jumps back near Penguin Island. Port Sorell is a great kitesurfing location with flat water sections and a lot of interesting coast. We finished at 2 p.m. then packed our bags on the grass and drove to Launceston airport in good time for the flight. Its going to be hard to top this trip. We shall return! We drove to Stanley after the morning's big session at Marrawah. Peter took us into the delightful town where time stands still for a great coffee. The he took us on a short tour over Green Hills Road to the huge beach where the West Inlet downwinder finishes. There views along the coast and backl to "The Nut" are dramatic. 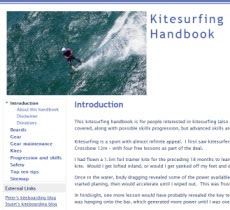 Then Peter took us down onto the beach at the East Inlet and gave instructions on how to kite in the channel of water (it was low tide) with the westerly still blowing. Its an unlikely combination of wind and terrain that we wouldn't have figured out ourselves. A couple of windsurfers were doing speed runs out there. Tarren, Stuart W and James set up and walked their kites across the windswept sand to the channel and had a long session on the flat water. Stu S and I headed into town to look for the anchor (or rudder?) of the tall ship Defender that Stu's father worked on restoring at Stanley. The ship was recently sunk in the Townsville harbour but may be refloated. Stanley is a very neat town with original cottages and buildings intact. It is a great place to mooch around and take in the scenery. We found an anchor, but Stu checked with his father who said the part of the ship was a rudder and it was in the small museum. We drove back and picked up the others after their session. The water was flat and they clocked some good speeds. I'm not sure it would have been as much fun on a surfboard though. Session 395. Another epic day of kitesurfing at Marrawah. We cooked some bacon and eggs for a hearty breakfast in the shelter enjoying the great view. There was a bit less wind today so I used my Union 10 which was ideal for the conditions. Peter drove again from Wynyard to kitesurf with us. We took turns lining up for the big waves and scored some beauties. The wind direction was better too. The waves didn't close out and there were gaps between sets so getting out was usually not too difficult. Ideal kitesurfing conditions and another excellent surf session. Towards the end of the session Tarren's kite burst a strut and James caught his kite in a wave and ripped it, so there was some gear damage but still big smiles all round. We cooked up some snags for lunch then drove to Stanley for a bonus session in the afternoon.